Home Off Beat	Fold & Carry Your Bike With You! Fold & Carry Your Bike With You! Compact Bikes that completely folds for easy portability will not be a dream anymore! 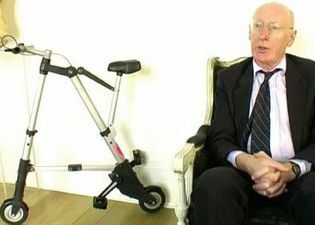 Sir Clive, who first unveiled the folding-bike concept back in 2004, is now all set to launch his wacky invention on Wednesday 12 July. The A-Bike is very compact and light. It weighs just 5.5kg and looks small enough to be easily carried into a backpack, once fully folded. The bike will sell for $300. So, if you enjoy biking a lot then now you can carry your bicycle with you, wherever you go! GAZE Relaxation Room — Comfort personified!